I have begun to realize something about our foods and the things or lack of them in simple things we have in our pantries. Reading labels have been something I have begun to do. 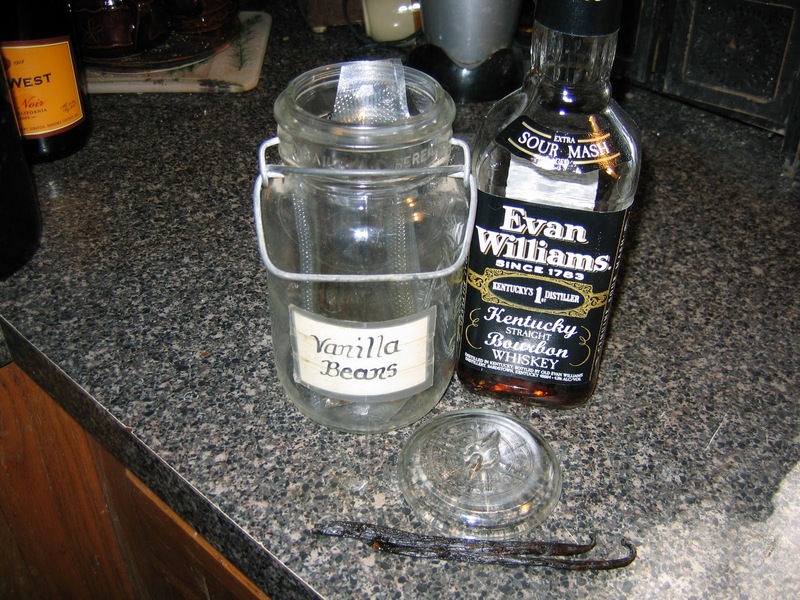 If you read the label on any store bought bottle of Vanilla you will find that they contain alcohol (for preserving) but also water. In the imitation vanilla you are getting a synthetic version of it, yuk! This bottle will cost you about $4.69 in the grocery store and it isn't even really pure! 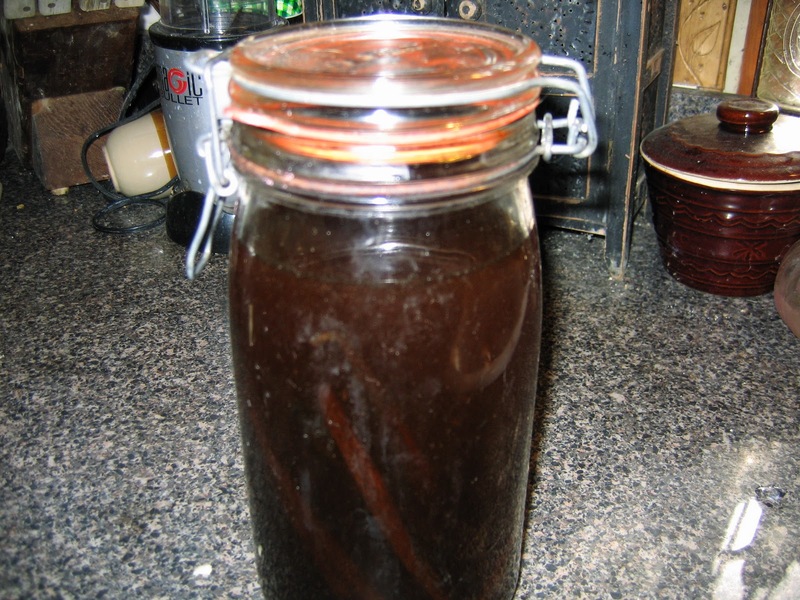 What you will need to make your own is a large glass container. 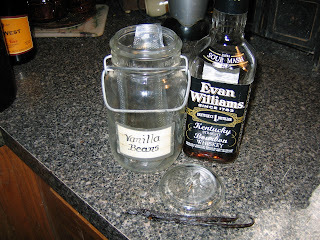 I use a large bail latch jar, some cheap bourbon whiskey, vodka or any other carrier, and some vanilla beans (I purchased mine on ebay! ), small bottles (got them on line to from SpecialityBottleCo.com) and the most important thing: about 6 to 8 weeks to soak the beans for the ultimate flavor. When soaking the beans place in a cool, out of direct light area as possible and shake almost everyday. A jar this size I put about 15 beans in it. I check mine from time to time by opening it up and smelling it, the smell is wonderful, it's pure and you know what went into it. 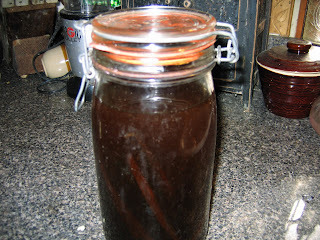 When ready, strain with double cheese cloth and transfer into bottles. Place a vanilla bean in the bottle. These make great gifts which I gave to my friends and family for the holidays! Yet another way of getting Back to Basics and keeping some money in your pocket! Thank you so much for sharing this great recipe. 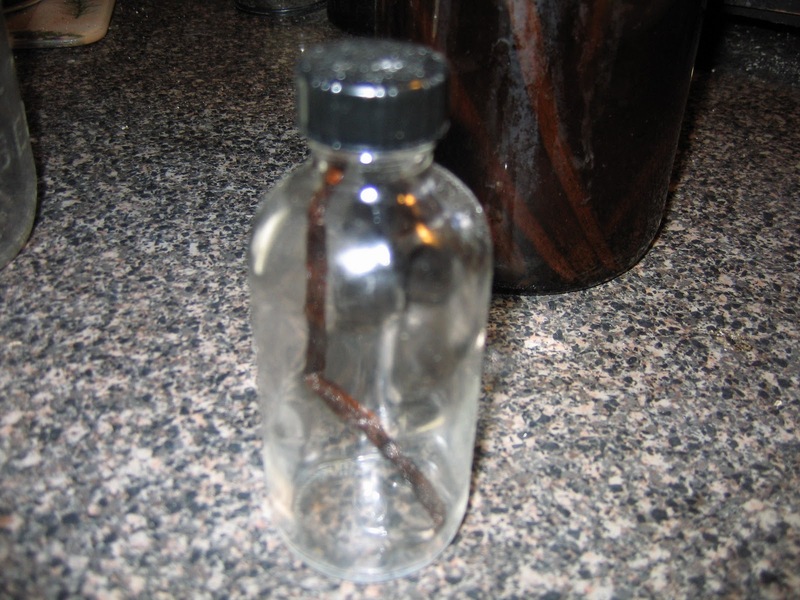 I have read about many people making vanilla and want to do it too. You just made up my mind. I'm ordering vanilla beans tomorrow morning. Your little farm babies are so cute. They look like giant teddy bears. I found your blob on Mountain Valley Farms blog. Have a great week.